Liverpool have reportedly held discussions over a potential transfer swoop for Juventus midfielder Sami Khedira as a replacement for Emre Can. The Reds have been facing a big worry over Can’s future for some time now, with the Germany international due to be out of contract at Anfield at the end of this season. Were he to leave, Liverpool would certainly need a big-name replacement in that defensive midfield position, but latest reports suggest they may be in luck. 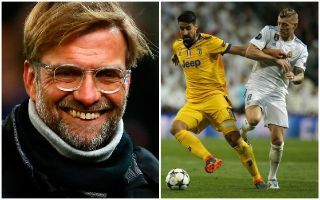 Amid discussions over Can heading to Juventus, Liverpool are said to have held initial talks over a possible move for Khedira, who’d be keen on linking up with Jurgen Klopp, according to the Sun. The 31-year-old is a similar style of player to Can and would add plenty of quality and experience to this Liverpool squad next season. A World Cup winner with the German national team in 2014, the former Real Madrid man has also won the Champions League, La Liga and two Serie A titles in a trophy-laden career. Can signing for Juve could mean Khedira’s own place in the first XI would be under threat so an exit could make sense for him as well at this stage.